Monsenso, a Copenhagen-based e-health company will receive 1.575 million DKK (around 211 000 EUR) from the Innovation Fund to start clinical trials that support the treatment of anxiety and borderline personality disorder. Combining digital technology with the expertise of healthcare professionals, Monsenso developed an innovative solution to help individuals tackle the burden of mental health. Monsenso provides an easy-to-use communication channel between healthcare providers and their patients which can make clinical treatment more efficient. Healthcare professionals use the cloud-based „mHealth” service to monitor patients, check warning signs and offer treatment. The patients, after self-assessing their symptoms on the smartphone app, receive regular feedback from their healthcare provider. The historical health and behavioural data collected from individuals can be analysed to predict illness development and mood forecasting. The E-mental project has recently been granted a total of 19 million DKK (2,5 million EUR). It is a collaborative project of The Mental Health Services in the Region of Southern Denmark (MHS), the South Denmark University, Aalborg University, Context Consulting and Monsenso. Monsenso is going to be involved in the Anxiety Monitoring Study and the mDIARY Study of the project. The Anxiety Monitoring Study aims to evaluate and implement the mHealth solution to help treat anxiety disorders. The objective of the mDIARY Study is to prove that the Monsenso DBT solution is a valid method for collecting patient data and can serve as an efficient solution to help patients’ recovery. In addition, the study will continue with a pilot study comparing the results of patients using a paper-based diary and patients using the mHealth app, as well as a two-year trial comparing the effects of using the mHealth app including coaching suggestions and using paper-based self-assessments. The overall research will also include a cost-effectiveness study to evaluate the mHealth solution. 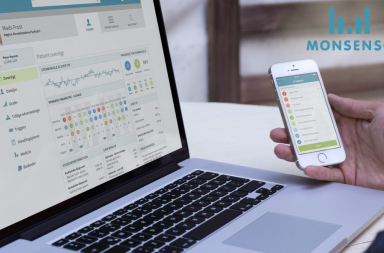 “The mHealth solution developed by Monsenso has the potential to revolutionize the treatment of psychiatric illnesses. The support received from the Innovation Fund will provide us with the necessary evidence to validate our solution clinically and financially for the treatment of mental illnesses.” – says Thomas Lethenborg, CEO at Monsenso.